LeafFilter North - For the most part . . . pleased. Apr 16, 2018 Hi Mark- Thank you for your feedback. We have notified the appropriate management of your concerns and will be contacting you soon. 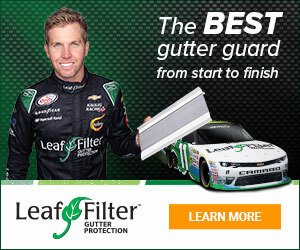 In the future, feel free to reach out to our Service Department at 1-800-749-4566 or service@leaffilter.com for assistance. Had new gutters and Leaf Filter installed on Thursday Apr. 12. I was impressed with the quality of the materials. My contract said the installers would arrive between 8 and 10 AM. When 11 o'clock rolled around I called the company but got switched to customer service who said the installation manager would investigate and call me back. No one called. The installers finally arrived at 11:30; no big deal. I have a second story roof that had no gutters and drained directly onto my first story roof. So, I purchased new gutters and filter. Towards the end of the installation, one of the installers said they did not have enough elbows and needed to go to a home improvement center to purchase them. Rather than make them move their truck and trailer I drove him just a couple of miles to our local ACE hardware store. The downspouts installed from the second story gutters emptied onto the roof rather than being run into the first story gutters. The installer said he did not have additional material. It rained today (Apr.14). Reason of review: incomplete installation. Review #1233700 is a subjective opinion of SpikyAmericanEskimoDog.